An analysis of aerial drone footage showed widespread new damage in Syria's besieged enclave of Eastern Ghouta. Eastern Ghouta, a swathe of towns and farms outside Damascus that is the last major opposition-controlled area near the capital, has turned into a skeleton of its former self. It has become a city of craters, debris and damaged structures. Even in neighborhoods with respectively less damage compared to other parts of the city, apartment blocks with their façade ripped apart and bare rooms can be seen. Rooms do not have walls, and are only distinguished by internal columns. When there is a lull in the shelling, locals prefer to travel via motorbikes. Not even places of worship are safe from being targeted, as the video shows mosques stripped of their minarets. 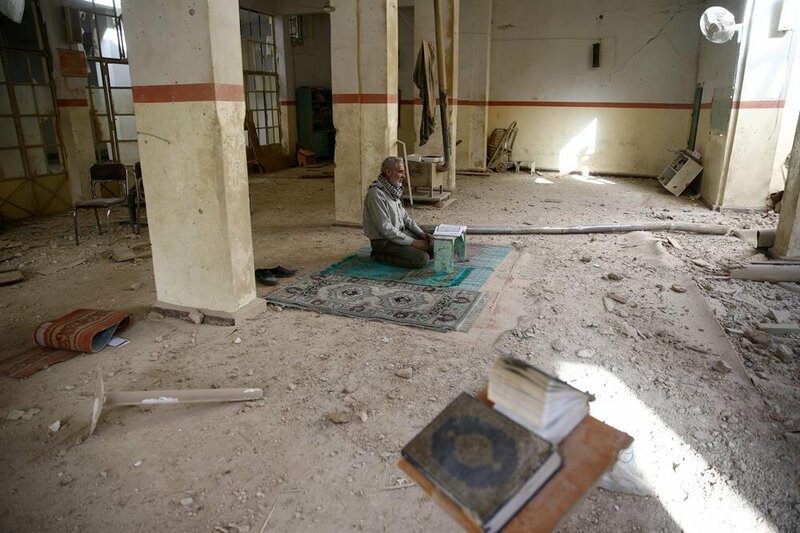 In the last two weeks, the Syrian regime has targeted 22 health centers, a mosque and an orphanage. There are few differences between the ghost town’s cemetery and the remaining parts of the city. 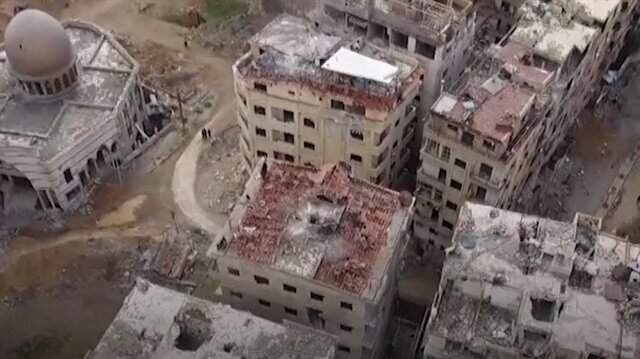 Drone footage shows the widespread damage across Syria's Eastern Ghouta as a result of bombardments by the regime of Syrian President Bashar al-Assad. Russia, a staunch ally of Assad, called for daily five-hour local ceasefires to establish what it calls a humanitarian corridor so that aid can enter the enclave and civilians and the wounded could leave. But the first such truce on Tuesday quickly collapsed when bombing and shelling resumed after a short lull. Hundreds of people have died in 11 days of bombing of eastern Ghouta, a swathe of towns and farms outside Damascus that is the last major opposition-controlled area near the capital. The Nur Mosque in Douma, which was built 120 years ago, was hit by warplanes of Russia, despite the country being one of the guarantors of the Astana agreement, which declares the suburb a de-escalation zone. Russia and Turkey, along with Iran are sponsoring the Astana peace talks, which focuses on a cease-fire and ending the six-and-a-half-year civil war in Syria. Russia and the Syrian regime continue shelling the city despite the UN call for a ceasefire. According to the White Helmets civil defense agency, a total of 674 civilians were killed in the last 12 days. Of those, at least 107 were children and 76 were women. 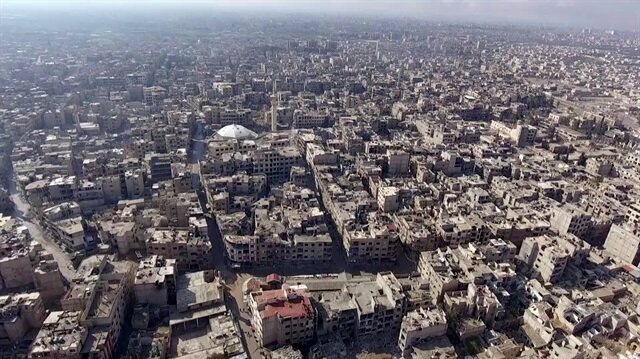 There are approximately 400,000 people trapped in the besieged city. Since Feb. 19, escalating hostilities have resulted in hundreds of deaths. UN Security Council Resolution 2401 was adopted unanimously on Saturday, which calls for a 30-day ceasefire in Eastern Ghouta to allow the delivery of badly-needed humanitarian aid. Russia, a staunch ally of Assad, called for daily five-hour local ceasefires to establish what it calls a humanitarian corridor so that aid can enter the enclave and civilians and the wounded could leave. But the first such truce on Tuesday quickly collapsed when bombing and shelling resumed after a short lull. Russian proposals for humanitarian corridors to evacuate people from eastern Ghouta in Syria are a "joke" and people are afraid to use them for fear of conscription, exile or death, the U.S. State Department said on Thursday. A Russian plan for a five-hour pause in fighting in Syria's eastern Ghouta needs to be expanded to allow aid deliveries to enter and civilians and urgent medical cases to leave, United Nations officials said on Thursday. Since then, hundreds of thousands of people have been killed and more than 10 million others were displaced, according to UN officials. The accord of the Russian proposal for a five-hours ceasefire in Eastern Ghouta is "a joke," State Department spokesperson said Thursday. "What needs to happen instead is a nationwide cease-fire that was voted upon unanimously at the United Nations last Saturday," Heather Nauert told reporters at a press briefing. "Fifteen countries supported it, let me remind you. So did Russia. "Nauert said the ceasefire resolution adopted by the UN Security Council (USNC) Saturday is "clearly not working", and more than 100 people were killed since then.UN Security Council Resolution 2401 was adopted unanimously on Saturday, which calls for a 30-day cease-fire in Eastern Ghouta to allow the delivery of badly-needed humanitarian aid.However, Russia and the Syrian regime continue shelling the city despite the UN call.Holding Russia responsible for the continuation of killing civilians in the besieged Damascus suburb and equipping the Syrian-regime military, she urged Moscow to obey the UNSC's humanitarian ceasefire resolution.The suburb has been under siege for the last five years and humanitarian access to the area, which is home to 400,000 people, has been completely cut off.In the past eight months, forces of the Assad regime have intensified their siege of Eastern Ghouta, making it nearly impossible for food or medicine to get into the district and leaving thousands of patients in need of treatment.Russia's Red Army choir to give concert in IstanbulUN says Russia must upgrade its Eastern Ghouta aid planUS can't dictate which terror groups to fight: TurkeyAccording to the White Helmets civil defense agency, regime attacks have killed more than 389 people in Eastern Ghouta in the past six days. Syria has been locked in a devastating conflict since early 2011 when the regime cracked down on demonstrators with unexpected ferocity.According to UN officials, hundreds of thousands of people have been killed in the conflict to date.